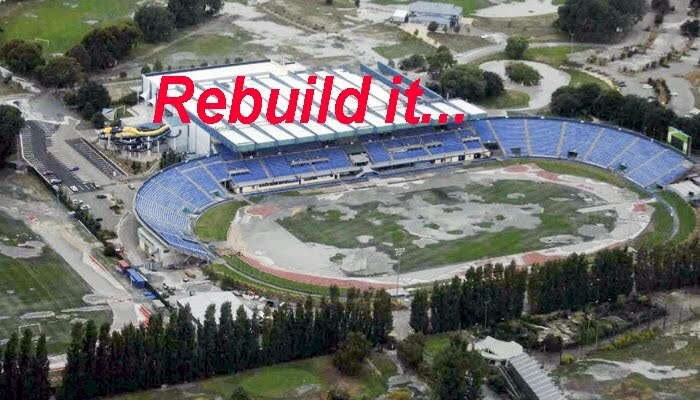 I've been highly critical of the planning that led to the Christchurch we know was built before the earthquake. And I was also critical of some of the planning for the CBD post-earthquake. In particular I could not believe the institutional silence around previous earthquakes that knocked the Cathedral spire down. However. Now that we are where we are, I now believe that New Zealand has a duty to protect as much as possible of the Cathedral from further demolition and from future earthquakes. The rhetoric is compelling: the city is Christ Church, the centre of Christ Church is Cathedral Square, Christ Church is internationally known as the Cathedral City. There is massive value and history attached to this place and the icon that is the iconic church at the centre. There are famous cathedrals and churches in Cologne, Coventry and Kobe - still standing, or rebuilt, iconic heritage, memories enshrined. Proudly. At a cost. A heritage cost. An investment. Canterbury Cathedral has similar status for New Zealand now. Yes it is vulnerable and the Church of England can't pay the amount needed to protect it. 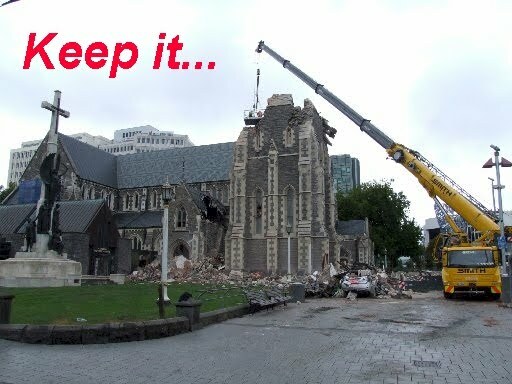 But it is essential for the future of Christchurch that the church that remains - remain standing. It is precious for the economic future of Christchurch, as it is for the city's cultural future and its heritage. What better place to remember where the city came from, and to remember the earthquake itself. This has to be a Government responsibility and priority. Which brings me to the 4 Avenues area of the old central business district. What to do, now that 800 or so buildings have been or are being demolished. I read the Listener magazine piece by Bob Jones, and agree with amalgamation of sites idea. Not sure about a lot of water spaces in there. 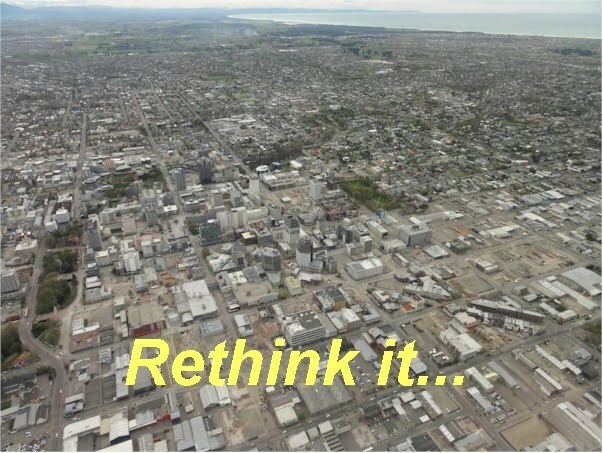 But it is clear that the market will not rush into building commercial buildings now in this part of Christchurch. A lot of money has already gone - to Auckland and other parts of New Zealand - and many businesses have relocated to other commercial hubs in other parts of Christchurch where there is some critical mass, and where there is infrastructure they can connect into. But. Stadiums are very expensive things as we know, and we look at what's happening in Dunedin right now. The Super 15 games that have been playing in the Christchurch temporary rugby facility have had a great buzz about them. Recessions are not good times to rebuild the sort of stadium that Jade was - ie very big - very imposing, takes up a lot of space, and hardly gets used. Doesn't do a lot to activate an urban environment either. 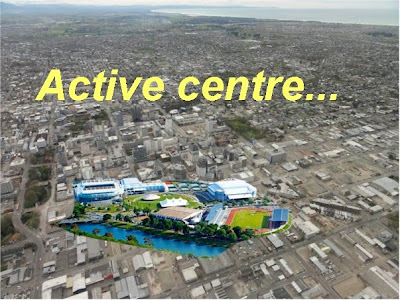 The South Island has other centres, but they are constrained in their accommodation offerings, and do not offer the space that Christchurch now has to be the active life-style support city for the South Island. Christchurch needs to be able live this lifestyle itself. Putting an upgraded QEII facility in the centre provides a new magnet, and new organising force for transport: cycling becomes much more dominant and rational. So does the related infrastructure. So does walking. And the sorts of businesses that would co-locate will be tourism, event and support services - event management, clothing, gear, and even manufacturers that specialise in elite sport equipment. Well. That's what I think aanyway. 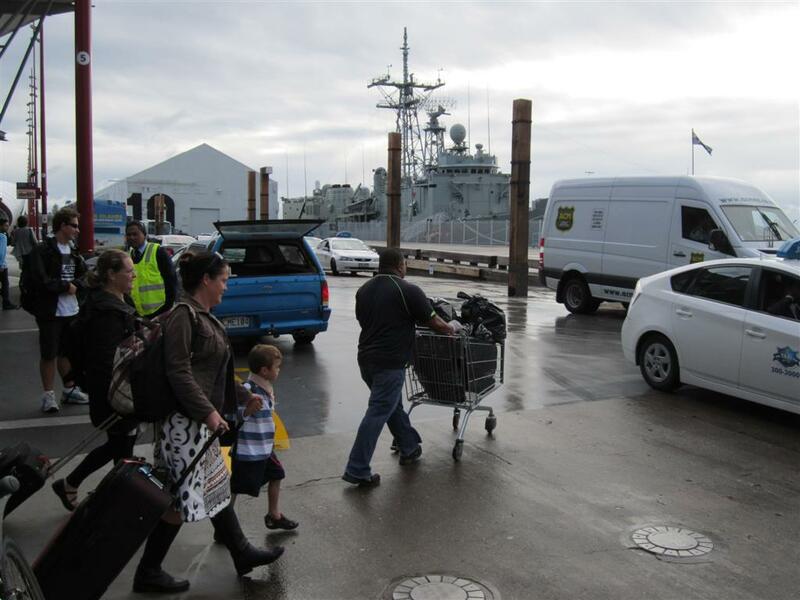 Queens Wharf is becoming a traffic hazard for pedestrians entering and leaving the ferry terminal. At rush hour and throughout the day passengers transfer between the ferry terminal and Britomart and the bus stops in Queen Elizabeth Square. Of course everyone else has to cross Quay Street to catch that bus. Not too much of a hassle. But it strikes me as extreme laziness on the part of Auckland Transport to casually take up more public space to park its buses, and at the same time create a pedestrian hazard. You might think: 'exaggeration'. But I write this having almost been run over by a bus that tried to make it across the lights, just at the same time as a ferry load of passengers were unloaded, many of whom were running to Britomart. When this warship was in, pride of place was given to the huge BP fuel tanker plus ancillary cars. You could visit and look, but it wasn't a straightforward experience for family groups who ran the gauntlet to have a look. So. Auckland Council and Auckland Transport. Don't say you have not been warned. This growing accident risk is directly of your making. You will be liable for any accidents that are caused in the conflict that is of your making between buses, taxis, ancillary traffic - and commuters who have no alternative. If the plan is to pedestrianise Quay Street is genuine - in part - one or two lanes - doesn't matter - it does not make sense to introduce another traffic element that has to feed into and across Quay Street precisely where commuters are walking between modes at the busiest public transport interchange in Auckland. ... and of course there's the double-take, double-act, of Mayor Tiller and even Ex-Local Government Minister Nick Smith. 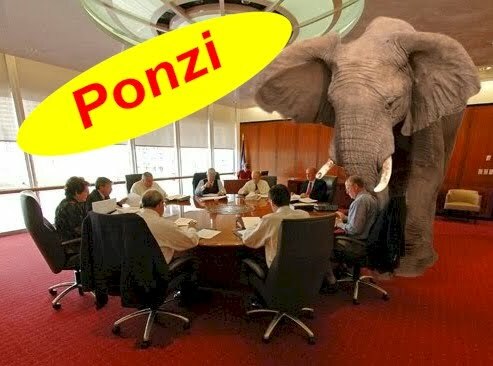 Smith had the gumption to use this Ponzi example is a reason for over-hauling local government, and going ahead with local government mergers. What Mangawhai needs is an accountable and democratic Council - not a bigger one that's further away. This is one hell of a Ponzi scheme, and the thing is, Council can't escape criticism. Not only can it not escape criticism, but it alone has to be liable for losses. 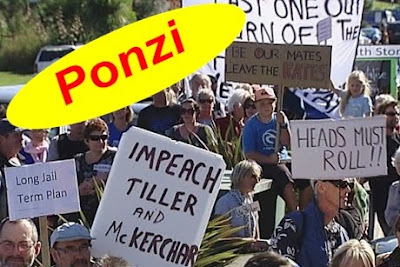 Why should existing ratepayers - whose benefit from this high risk investment - has already been paid for, be required to pay the Ponzi costs of a failed property speculation? I well remember being on North Shore City Council when it sold its shares in Auckland International Airport for around $80 million. The meeting was in confidential, but the halls and corridors were filled with brokers and dealers advising what price to sell at and what to do with the money. They wanted Council to invest the money in the stock exchange. Councillors got all excited. It was only the sober voice of the Chief Finance Officer who calmed everyone down and advised: "put it in the bank. This is public money. Council is not in the business of taking risks with public money..."
Pity there wasn't a similar voice of reason on Kaipara District Council when it voted and took out bank loans - in "public excluded" meetings - that underwrote speculative property development at Mangawhai. Albert Park is one of Auckland’s oldest public spaces, reflecting the formality and culture of early British colonisers and a clear planning distinction between public and private. Opened in 1979, Aotea Square reflects an altogether different history. It and Mayoral Drive were built following the demolition of lower Greys Inn Road and much of old Auckland’s urban fabric, enabling the creation of uncongested road access to the CBD and high capacity central city car-parking. Meeting the accessibility and mobility needs of private car owners was a far greater priority than the creation of a successful public space at Aotea Square. If Auckland’s citizens or visitors feel some sort of connection with a public space it is more likely to be successful, but Aotea Square’s success is limited to skateboarders and the protestors who recently occupied it. Public spaces reflect the character of a city. My favourites include the South Bank in London, Xocalo in Mexico City, and Odori Park in Sapporo. The earliest public spaces – Greek Agora - were formed within a civilisation which valued democracy and recognised and accepted cultural difference. Public spaces provided citizens the means of building community life. talk and learn about each other. They were building blocks for tolerance and understanding. If urban public spaces merely exist to provide more air, a view of the horizon to break the monotony of endless buildings, as a setting for alien artworks, or as places to park vehicles, they will not meet human needs and will be unsuccessful. Or if they are designed mainly as gathering places for consumers, like outdoor shopping malls dominated by shops and places to spend money - rather than time, then the broader public interest will not be served. But to be successful they must also provide reasons to be there that are more than merely offering a diverting place to chill, waiting for the theatre or film to start – though people-watching appeals to many. and embodied reminders of a city’s history, ancestry and heritage. Little of this heart and soul is evident in Aotea Square, though it is improving. The children’s playground at Wynyard Quarter is one of the greatest successes of that public space, though sadly its footprint is zoned for high-rise development. And maritime heritage and character reminders there are at huge risk from development pressure and a light-handed regulatory approach from Auckland Council. Queens Wharf is Auckland’s most recent public space. It was opened to the public two short years ago and rapidly became a political football. The moth-balled McCully Cloud and some cheap security fencing around its heritage shed are the visible reminders of that history. 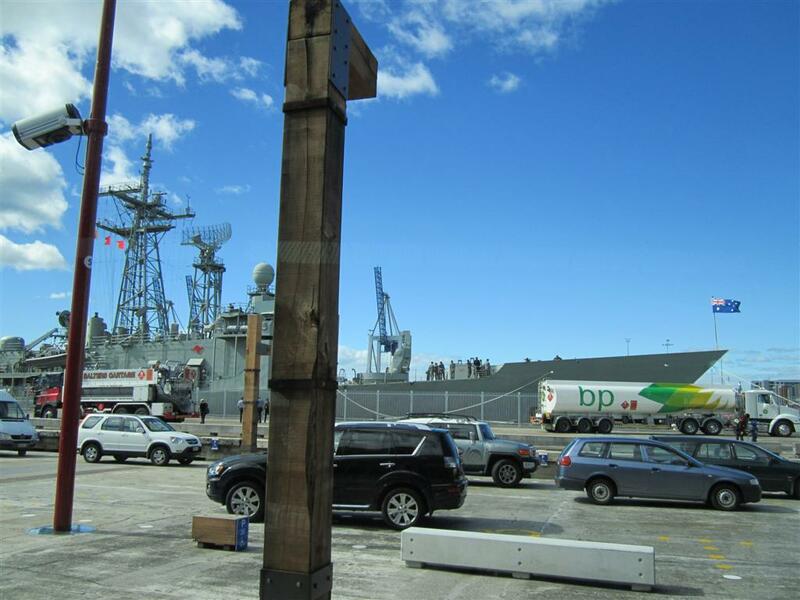 A sad superficial legacy for a place that embodies and still exudes Auckland maritime history. At least twice in its short public space life Queens Wharf has shown its potential for Auckland. The first was when two Chinese warships came to visit. Queens Wharf became a magnet for Auckland’s Chinese community – largely absent from the CBD following the unfortunate loss of the waterfront Oriental Market. The second was early in the Rugby World Cup when Queens Wharf and downtown Auckland glowed with the energy and laughter of its Tongan and Samoan peoples. Today, despite the sign that insists Queens Wharf is open to the public, it has been taken over by Airport Buses, taxis, casual traffic, and its very own roundabout and traffic lights, to the extent it is often dangerous for pedestrians entering and exiting the ferry terminal. All the talk of pedestrianising Quay Street seems empty when this ad hoc traffic makes the area unsafe. It would be good to see Council walking the talk on the waterfront. 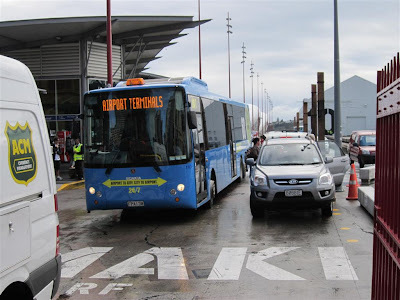 As a Devonport resident I now enjoy easy access to Airport Buses, but this traffic is the thin end of the edge, building up to the establishment of a primary cruise ship terminal with all of its associated traffic demands and which risks being the kiss of death for a truly successful public space on Queens Wharf. 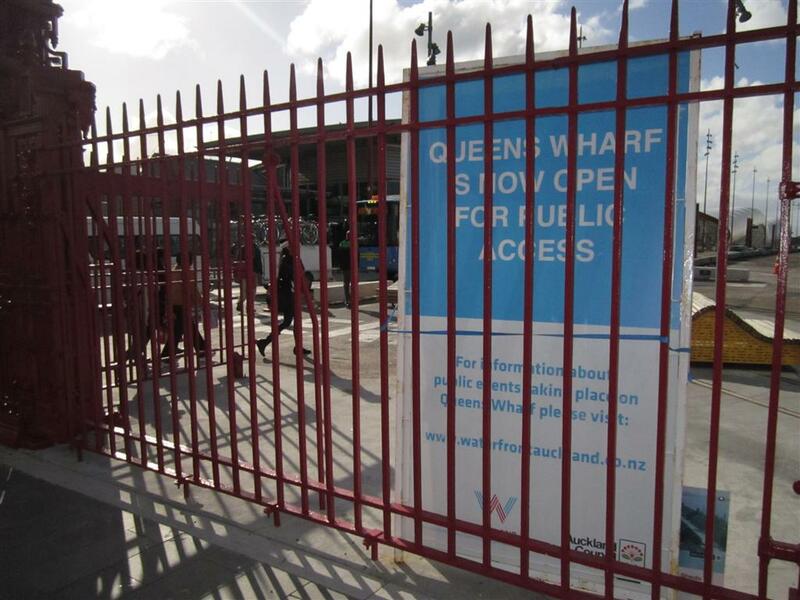 Thankfully, two thirds of submissions to Auckland Council’s Annual Plan oppose a Queens Wharf cruise ship terminal. If Council does not heed these submissions I will be among those who claim the Council is suffering from Agoraphobia – fear of successful public places.